This article is about the director and actor. For the American film critic, see Shawn Levy (writer). 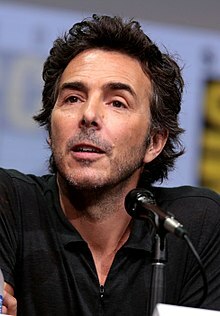 Shawn Adam Levy (born July 23, 1968) is a Canadian film director, producer and actor. His directing credits include Cheaper by the Dozen (2003), and the Night at the Museum series. Levy was a producer on the 2016 sci-fi film Arrival, which earned him an Academy Award nomination for Best Picture. Since 2016, Levy has been an executive producer on the Netflix original series Stranger Things. He has directed two episodes in the show's first season and two episodes in the second, and will be directing another two episodes for the third season. Levy in Moscow in 2011. Levy was born to a Jewish family in Montreal, Quebec. As a teenager, he attended St. George's High School and Stagedoor Manor Performing Arts Training Center in New York. Levy graduated from Yale University in 1989 majoring in Performing Arts. He received a MFA from the USC School of Cinematic Arts in 1994. Levy has a production deal with 20th Century Fox. He produced the 2012 Ben Stiller, Vince Vaughn, Jonah Hill comedy The Watch, which was directed by Akiva Schaffer. His television company 21 Laps produces the ABC/Fox comedy series Last Man Standing and the science fiction Netflix series Stranger Things. Levy's acting debut was in Zombie Nightmare (1986), a low-budget horror film in which he portrayed the character Jim Bratten, the leader of a group of teenagers. The film is best known for being featured in an episode of Mystery Science Theater 3000. He appeared in the 1988 Liberace: Behind the Music, as a post-Scott Thorson acquaintance of Liberace. His television acting resume consists of a guest spot on 21 Jump Street, a recurring role on Beverly Hills, 90210, and a role on 30 Rock as TV producer Scottie Shofar. In December 2017, Netflix announced a 4-year contract with Levy. Due to the successful seasons of Stranger Things, he will create TV projects exclusively for the streaming entertainment company. Levy was initially announced as the director of the film version of Minecraft, but has since left the project. He is the latest director attached to the film adaptation of the Uncharted video game series, following David O. Russell and Neil Burger. Joe Carnahan worked with Levy to produce the script for the film, but Levy left the project on December 19, 2018. Levy will also direct a film based on long-running children's series Sesame Street, which will be the show's third motion picture following Sesame Street Presents: Follow that Bird and The Adventures of Elmo in Grouchland, and its first in nearly two decades. Levy is married to Serena, with whom he has four daughters. Levy is Jewish and speaks fluent English, Hebrew and French. 1991 Our Shining Moment J.J.
1998 First Wave Yes No Episode "Marker 262"
2002 Do Over Yes No Episode "The Block Party"
Birds of Prey Yes No Episode "Nature of the Beast"
2006 Pepper Dennis Yes Yes Episode "Pilot"
2014 Cristela No Yes Episode "Pilot"
2016 Unbreakable Kimmy Schmidt Yes No Episode "Kimmy Drives a Car!" 2016–present Stranger Things Yes Yes Directed episodes "Holly, Jolly", "The Body", "The Pollywog" and "Will the Wise"
2017 Imaginary Mary Yes No Episodes "Pilot" and "The Mom Seal"
1989 China Beach Lieutenant "Dear China Beach"
1990 21 Jump Street Lance "Awomp-Bomp-Aloobomb, Aloop Bamboom"
Lifestories Luke Conforti "Art Conforti"
Step by Step Daniel "Way Off-Broadway"
2009 30 Rock Scottie Shofar "The Problem Solvers"
2016 Stranger Things Morgue Worker "Chapter Four: The Body"
^ "Shawn Adam Levy — The Guild / Members". Directors Guild of America. Retrieved November 12, 2017. ^ "Shawn Levy — Biography and Filmography - 1968". hollywood.com. February 20, 2015. Retrieved July 23, 2017. ^ "'Stranger Things' Season 3 Starts Filming Monday". April 21, 2018. ^ Nate Bloom (February 13, 2017). "The tribe goes to the Oscars". J. The Jewish News of Northern California. ^ "Shawn Levy Gets "Real"". USC Cinematic Arts. Retrieved August 6, 2018. ^ Berkshire, Geoff (July 22, 2016). "'Stranger Things': Shawn Levy on Directing Winona Ryder, Netflix's Viral Model". Variety. ^ Kroll, Justin (October 16, 2014). "Warner Bros. Taps Shawn Levy for 'Minecraft' Movie". Variety. Retrieved October 16, 2014. ^ Kroll, Justin (December 19, 2014). "Shawn Levy Leaves Warner Bros.' 'Minecraft' Film". Variety. Retrieved July 18, 2016. ^ Fleming, Mike (October 25, 2016). "Shawn Levy To Direct Uncharted Movie". Deadline Hollywood. Retrieved October 25, 2016. ^ Fleming, Mike (October 25, 2016). "Shawn Levy To Direct 'Uncharted'; PlayStation Vidgame Movie On Fast Track". Deadline Hollywood. Retrieved November 29, 2016. ^ Wade, Jessie (December 19, 2018). "Director Shawn Levy Steps Away from Tom Holland Uncharted Movie". IGN. Retrieved December 19, 2018. ^ Evans, Alan (November 10, 2016). "Sesame Street movie is in the works". The Guardian. ^ Cannell, Michael (August 2012). "Shawn Levy's Modern Farmhouse in Upstate New York". Architectural Digest. Retrieved April 11, 2013. ^ Bloom, Nate (October 17, 2003). "Celebrity jews". J. The Jewish News of Northern California. Retrieved July 23, 2017. ^ Chitwood, Adam (February 7, 2013). "Shawn Levy Returns to Direct 'Night at the Museum 3' for December 25, 2014 Release". Collider. ^ Kit, Borys (April 1, 2016). "'Starman' Remake In the Works With Director Shawn Levy (Exclusive)". The Hollywood Reporter. ^ Kroll, Justin (May 17, 2016). "Shawn Levy to Direct Sci-Fi Film 'The Fall'". Variety. ^ Kroll, Justin (November 8, 2017). "Fox and Shawn Levy Team on Sci-Fi Spec 'Crater' (EXCLUSIVE)". Variety. ^ "Anne Hathaway to Star in Robert Zemeckis' 'The Witches' (EXCLUSIVE)". Variety. Retrieved January 27, 2019. ^ "Anne Hathaway Eyes Starring Role in 'Sesame Street' Movie". The Hollywood Reporter. Retrieved January 27, 2019. ^ "'Sesame Street' Movie's Writer-Director Reveals Plot Details". The Hollywood Reporter. Retrieved February 6, 2019. Exactly how big, he can't say — sources say it will be in the $50 million range — but Krisel confirms that Anne Hathaway will star and that shooting could begin in late summer. ^ Wiseman, Andreas (March 15, 2018). "Netflix Boards Coming-Of-Age Slasher Movie With 'Stranger Things' Outfit 21 Laps And James Wan's Atomic Monster". Deadline. Retrieved March 24, 2019.